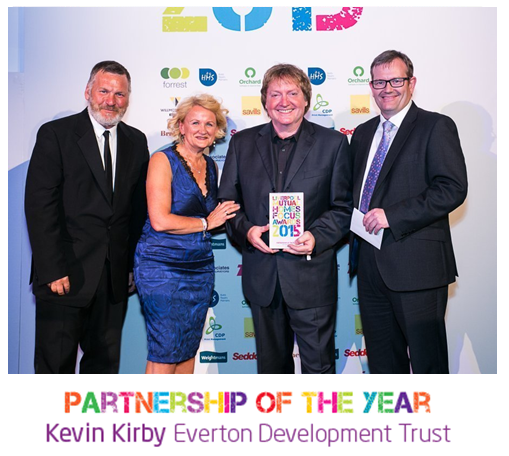 We are delighted to bring you the news that following our nomination as finalists at the recent LMH Focus Awards, Kevin Kirby and EDT were honoured with the Partnership of the Year Award. A splendid night was had by all at Liverpool's Camp and Furnace where Kevin was presented with the award by LMH's Angela Forshaw and Paul Worthington. The award was in recognition of the work Kevin and EDT have done in establishing LMH IT Hubs at numerous locations across the city. "I really am thrilled to have received the award" said Kevin...."it's very gratifying to know that the work going on in the Hubs is appreciated by LMH and their tenants....and I'd like to thank the Digital Inclusion team at LMH who I work with on a daily basis - Leanda, James, Leslie and Anita - they ensure that the project runs smoothly and they really couldn't be more helpful"..."hopefully, with the possibility of more IT Hubs on the horizon and with tenants becoming increasingly aware of the benefits that digital inclusion can bring, the partnership will continue to go from strength to strength". 'EDT provides great support for digital inclusion and has helped many to access savings online, find jobs and improve their quality of life. Their approachable team provides one to one support in a friendly and open manner. Kevin Kirby is an outstanding teacher who goes the extra mile in his role and has a good relationship with his students, helping them develop a positive and confident attitude to learning'.